I'd really appreciate some help from those of you who have a much better understanding of the app_info.xml than I do. Since upgrading to a R9 390, Milkyway@Home doesn't work as standard with that card. So apparently I needed to create a app_info.xml readme file. I found one which was on these message boards and copied/pasted into my folder and it worked!! Woo Hoo. 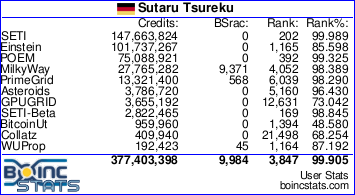 Unfortunately I'm guessing something has changed in BOINC because it now no longer works. Could someone please help me to get back on track? Thank you for your help and happy crunching!! Message 64951 - Posted: 29 Jul 2016, 3:59:15 UTC - in response to Message 64950. Milkyway updated the 'Milkyway' apps from 1.20 to 1.36. Have a look in my/the thread, Message 64939. If you have an app_info.xml file in the project folder, you need to update apps on your own. It don't go automatically. In your case, if you don't get new tasks, compare the versions numbers (or apps) in the app_info.xml file with the versions numbers of the currently available apps here (or look to their creation/release dates). Message 64952 - Posted: 29 Jul 2016, 8:23:31 UTC - in response to Message 64951. I did read your thread but I have no idea if I could just copy & paste that into my folder as we have different GPU's. I receive WU's but they are all invalid or validation inconclusive. Not a single valid WU. Maybe everywhere I see a version 1.20 I should change it to 1.36? Message 64953 - Posted: 29 Jul 2016, 13:37:42 UTC - in response to Message 64952. I didn't know that the Milkyway server send tasks to outdated version numbers in app_info.xml file. If you use an app_info.xml file, you MUST observe what your PC do. If you use an outdated app you will 'destroy' all tasks (maybe also the science?). Until now I saw no 'officially' statement about these settings/what they do. If you like, then use them carefully (after testing). Message 64956 - Posted: 29 Jul 2016, 23:20:28 UTC - in response to Message 64954. Thank you for your efforts to help. Unfortunately, I really have no understanding of what you are saying or how all that code works. I copied and pasted exactly what you wrote in your last post but it doesn't work. 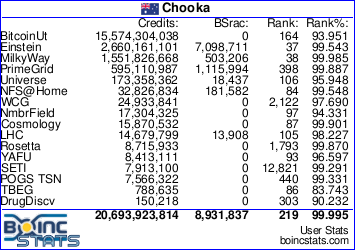 BOINC says I don't have a usable version. I'll struggle on. Just wish they would fix it so that the newer AMD cards would work ffs. Message 64958 - Posted: 30 Jul 2016, 10:27:33 UTC - in response to Message 64956. Did you manually download the apps? If not then it won't work!! You NEED to have the versions specified in the app file or your pc is just 'looking' but not doing anything. It's kind of like me telling you to take your car to the gas station and put gas in it, but you DON'T OWN a car, how can you follow my directions? Sure you can go to the gas station, as your pc is trying to do, but you can't put gas in something you don't own, as your pc is not crunching because it doesn't have the app file versions you are telling it to use!! Message 64962 - Posted: 31 Jul 2016, 7:17:39 UTC - in response to Message 64958. So I don't really understand? Download the apps? I had a working version up until a few weeks ago. It finds work and downloads the units but they all come up as invalid or inconclusive now. I'm not sure what's changed in the last few weeks to cause my app_info.xml file to not work anymore. Unfortunately I just find all this .xml stuff too confusing. Even though I have donated to this project and enjoy it, I'm not technically minded enough to make it work anymore. I might build my own PC's but talk to me about computer language....and you'd might as well talk to me in Chinese. I'll just move on to Einstein@Home. Message 64975 - Posted: 3 Aug 2016, 12:47:28 UTC - in response to Message 64954. Thank you so much Dirk ! It worked perfectly for me on a R9 380 running under windows 10 64 bits and boinc 7.6.22. This way, I can separate applications informations (app_info.xml) and attributed ressources (app_config.xml). Four tasks are done at the same time in 1'40"-1'50", avoiding GPU non-working time when a task is completed. I tried a WU there and it worked. That's maybe an idea ? Ok so I've regained a little patience to try again. I copied & pasted what you put up Dirk - All of it. I created a XML file with all of the above and saved it in my BOINC folder. I restarted BOINC but it will not fetch any work. Where have I gone wrong?. [AF>EDLS]GuL - Where did you insert that text in the file? Thank you for the help. I'm sure I'll get there one day. So I copied your XML file into this directory rather than the general BOINC folder. I also copied the links that you posted into the same directory which over wrote the old ones. I'm now fetching work at least but they are still MOSTLY validation inconclusive. (107) with only 2 WU's valid. Message 64980 - Posted: 4 Aug 2016, 8:37:56 UTC - in response to Message 64977. All the app_info stuff from Dirk is going into a file called app_info.xml. Be careful that by default, windows extensions are not shown. So your file can in fact be app_info.xml.txt, which is not correct. The app_config.xml is another file to create, but it is only optional. The files .exe have not to be executed alone, but they are needed to crunch. All these files need to be placed into your milkyway directory C:\ProgramData\BOINC\projects\milkyway.cs.rpi.edu_milkyway . This is a hidden directory. Once it's done, you can turn off boinc, not only pausing computation, and then start it again. If everything is right, you should see in the event log references to app_info.xml and app_config.xml for milkyway, and crunch will start. Message 64981 - Posted: 4 Aug 2016, 8:41:13 UTC - in response to Message 64980. Ooh Ooh I think I've got it. Thank you for your help. No real idea how I fixed it. Appreciate your patience with me. Message 64982 - Posted: 4 Aug 2016, 8:41:19 UTC - in response to Message 64979. Just be patient. The other guy needs also to compute your task, and they must agree. If you have no errors, that's great ! Anybody here who has a app_info for NVIDIA ?